It was a day of excitement as the JASO J438 electric luffing tower crane arrived on GV Health’s Shepparton site on 15 semi trailers. The buzz around the hospital was electric, as the first couple of trucks arrived with parts of the gigantic tower that sits 90 metres above the ground. But it is fair to say, the most excited was six year old, Lily Shay Crane, the winner of our Name the Crane Competition. We had so many fantastic entries and some very creative names put forward, but we could only choose one winner. 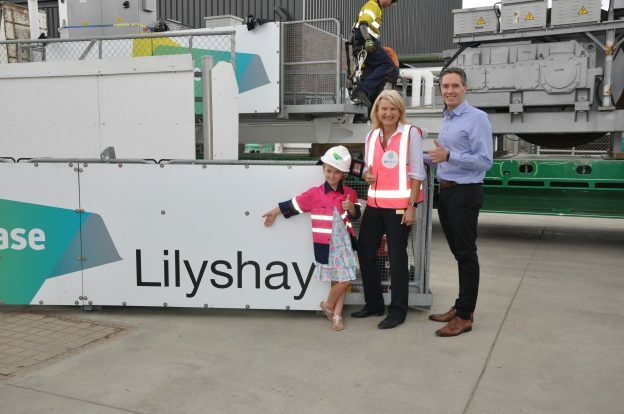 Lily and her family visited GV Health on Friday 8 February 2019 to see the ‘Lilyshay’ sign mounted onto the cabin of the crane that will be on site for the next 31 weeks to build the hospital’s new five storey Inpatient Unit tower. The building of the tower is all part of GV Health’s $171 million redevelopment that is currently underway, funded by the Victorian State Government. The name Lilyshay was chosen because ‘Shay’, Lily’s middle name, was her uncle who passed away in 2002 and who spent time at GV Health after a car accident. His organs were donated, saving seven people’s lives. Lily was presented with her very own high visibility shirt and helmet with her name printed on the front and back, and was given the opportunity to sit in the cabin with her younger brother, Jacob. After all her media duties were complete, Lily and her family headed home with big smiles and a little weary from all the excitement. Lily said that when the tower crane comes down and she gets to keep the ‘Lilyshay’ sign, she hopes to put it up in her bedroom. Let’s hope she has big walls! The crane’s erection was finished on Saturday and can be seen from all over Shepparton.